Notes: Zucchini blossoms are sold in some specialty produce stores as well as in farmers' markets (often attached to the squash), and can sometimes be ordered there. But if you don't have access to the blossoms, don't shy away from this dish; it's almost as tasty - if not as beautiful - without the flowers. In a 5- to 6-quart pan over high heat, bring 3 to 4 quarts water to a boil. 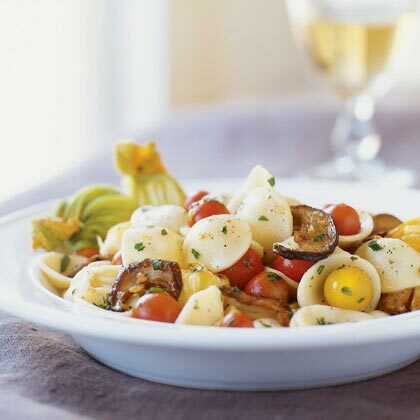 Add orecchiette and cook, stirring occasionally, until barely tender to bite, 15 to 18 minutes. Meanwhile, rinse and drain zucchini blossoms; reserve about four blossoms for garnish. Pull petals from remaining blossoms and cut lengthwise into quarters; discard tough stem ends and other parts. Pour 2 tablespoons olive oil into a 10- to 12-inch frying pan over medium-high heat; when hot, add garlic and porcini and stir just until mushrooms are limp and liquid is evaporated, 5 to 6 minutes. Stir in herbs and remove from heat. Drain pasta, reserving 1 cup cooking liquid, and return to pan. Add mushroom mixture, along with tomatoes, quartered zucchini blossoms, remaining 1/4 cup olive oil, and salt and pepper to taste. Mix gently over medium-low heat until warmed through, 5 to 7 minutes. If pasta is too dry, add reserved cooking liquid as desired. Spoon into wide, shallow bowls and garnish portions with reserved whole zucchini blossoms. Top with parmesan curls if desired.